This is usually a simple DIY fit taking around 30 minutes. 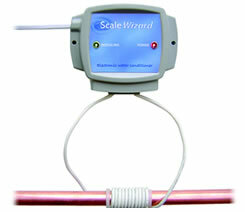 The Scalewizard is normally installed on the cold water mains pipe in a convenient location where it enters the house. This will then cover the water supply for the whole house. Should this not be possible, it can be fitted to the inflow or outflow of the cold water tank or to the cold feed of the hot water system. This will then cover all hot water in the house which is the main cause of most scale. The Scalewizard unit can be fitted up to a metre away from the pipe location and a mains socket outlet will be required within 3 metres of the unit. Longer leads can be supplied to special order. You will need a minimum of 10 cm of straight pipe for fitting the wire coil. The coil is wrapped around the pipe, which can be of lead, steel, copper or plastic. If the pipework divides before you are able to install the unit, it is possible to treat two pipes using a single coil on each pipe. The pipe location for installation can be horizontal, vertical or diagonal and the electronic unit can be placed at any suitable angle without affecting operation. Comprehensive fitting instructions are supplied with each unit and our technical support team are available if there are any particular fitting problems that require discussion.